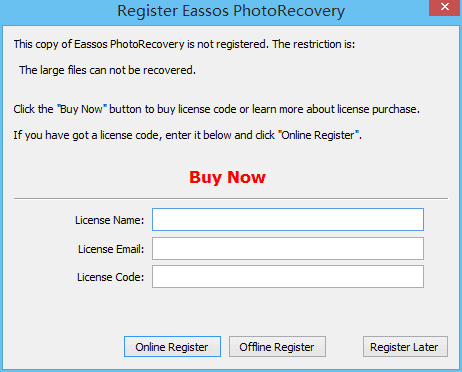 Eassos Photo Recovery is shareware though, it can be downloaded and tried for free before payment. You are able to scan and preview lost photos or pictures before the program is registered. You can preview hex data of those file formats that program doesn't support preview. Moreover, files smaller than dozens of KBs can be saved and copied even though the software is not registered. If Eassos Photo Recovery has found all lost photos you need, then you can buy it from our official store:"www.eassos.com/buy.php". License code will be sent automatically within minutes. Enter License Name, License Email and License Code on the dialog box below and click "Online Register". 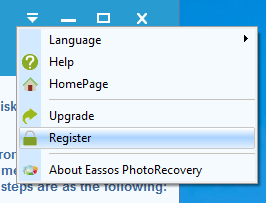 If your computer can't connect to the Internet, then you can click "Offline Register" to register Eassos Photo Recovery by following prompts.